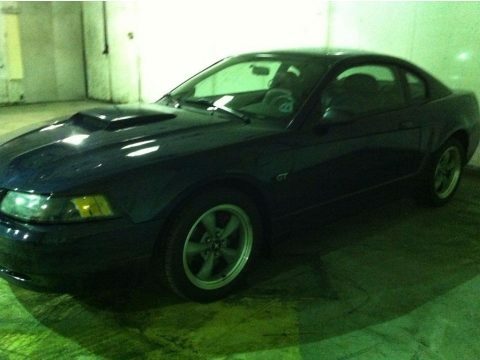 2001 Ford Mustang Bullitt GT For Sale in Charlotte, North Carolina 28226 Looking to make a statement as you drive down the road? With small-block V8 power under the hood of this Pony, there's plenty of torque. The engine sounds great at full song, urging you to keep your foot in it, yet it burbles along when cruising, attracting lots of attention from those around you. Excellent handling response will keep you involved as you handle the reins. This 2001 Bullitt comes still has the original window sticker. Only 17,700 miles, garage kept since new, beautiful "True Blue," new Performance Michelins! Cobra brake calipers and drives like a Cobra. All original - no add-ons. This Bullitt is smooth, quiet inside, ominous on the outside when I need to get up and go! The look is reminiscent of the '64-66 original from the three-element taillamps to the prominent but non-functional hood scoop. And don't forget the chrome pony on the grille. The V8 is listed at 260 horses and 302 ft-lbs of torque. The Mustang suspension allows the car to be predictable during hard cornering, and side-to-side weight transfers are progressive for added stability during high-speed lane changes. You'll love this car, and it'll love you back with thrilling performance, a comfortable ride, and classic Mustang Bullitt style and looks. Ford only made 5500 - Only 717 were "True Blue." "Ooh, I love it!" young women say. The men say, "That's a bad Mustang, man." This Mustang is a must see and drive! Call (402) 502-8385 for more information.